La Escuela del Campo is situated some way below the ruins of the ancient city of Acinipo, now known as "Ronda la Vieja', on the border of the provinces of Cadiz and Malaga. It is very accessible by road and by air, being just some 100 km from three airports: Malaga, Seville and Jerez de la Frontera. We would be delighted to send you a detailed 'how to find us' map by e-mail. 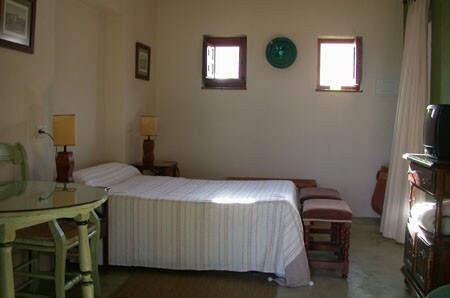 The classrooms of the old school have been converted into delightful guest accommodation: 'Casas Rurales". From the Escuela del Campo there are magnificient views to the Sierra de las Nieves, the Sierra de Ronda, and as far as the Sierra de Grazalama, which is a wonderful area for walking. In our library we have an abundance of route maps both for walking and for cycling. 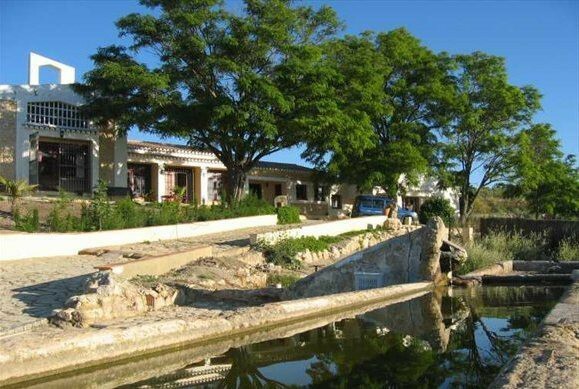 "La Escuela del Campo" is situated in an area of unspoilt natural beauty, a paradise for bird watchers, walkers and those who simply want to enjoy the open air amid rural tranquility. 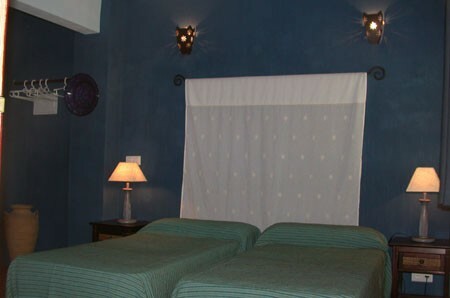 And after a vigorous day in the open air you can have a refreshing swim in our pool. The nearby ruins of Acinipo, which include one of the most perfectly preserved Roman theatres in Spain, offer a fascinating glimpse into the past; with traces of the occupation from Neolithic remains, through Phoenician settlement, on to the glories of imperial Rome. Ronda is a beautiful and atmosferic city with its famous bridge over the gorge (El Tajo), through which runs the river Guadalevin, dividing the city in two. Ronda was occupied by the Moors for nearly seven hundred years and has many reminders of that time, particulary the City walls. The fifteen minute drive to reach the city from La Escuela del Campo takes you through ancient cork oak forests, and a wide landscape of corn and vineyards. There are black pigs, the famous Spanish "pata negras', Spanish horses and even, sometimes, a mule. Ronda is famous for many attractions: the most outstanding of which is the 'Plaza de Toros', built in 1795; and of course, it has a lot of bars serving delicious 'tapas'; plus a great variety of excellent restaurants. 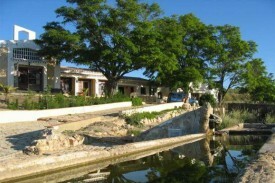 The nearest village to La Escuela del Campo is 'Setenil de las Bodegas', one of the White Villages of Andalucia. Setenil de las Bodegas is fascinating for its 'troglodytic' houses, built into the living rock of the gorge in which the town is situated. In former times the town was the center of a famous wine producing area and the wine was stored deep in the cool caves of the gorge. Olives from the surrounding countryside, including those from La Escuela del Campo, are processed here to produce an olive oil for which Setenil is now justly famous, having several times won the distinction of the best olive oil of the region. This price includes breakfast, bedding and towels. There are no telephone land lines in this area and for this reason, we regret, we are unable to accept payment by credit card. Zeer vriendelijke en gedienstige uitbaters. Veel info over de streek. Een mooi gebouw met mogelijkheden. De kamers gaven een ietwat afgeleefde indruk, geschilderde chapevloer, soms geen waterdruk, vuilbakjes werden niet geledigd. Het was nu wel geen zwemtemperatuur meer maar het zwembad gaf een troosteloze indruk (bladeren en spin op de bodem). Geen zin om naar huis te gaan ! ! ! Dank aan Maria en Luc voor een prachtig verblijf. Begin mei 2010 verbleven wij een week bij Luc en Maria. Een warm en gastvrij B&B. Ogenschijnlijk zonder moeite hebben zij ons verblijf, in de toen koude week (17 graden!! ), tot een feest gemaakt. Het overheerlijke ontbijt, de uitstekende tips, de prima kamer, de ongedwongen sfeer, alles rechtvaardigt de hoge waardering waarmee hun bedrijf beoordeeld wordt. Did you stay in La Escuela del Campo? Let us know what you thought about it and help others to make the right choice! * I confirm having stayed in La Escuela del Campo. 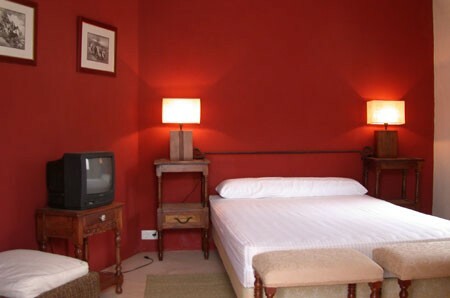 Find other bed & breakfasts in Ronda, all bed & breakfasts in Málaga or all bed & breakfasts in Andalusia.